Home › Islam › More revelations to come in the coming months..
More revelations to come in the coming months..
Jonathan AC Brown is an American convert to Islam and a professor at Georgetown University’s Edmund A. Walsh School of Foreign Service. In 2014, he was appointed Chair of Islamic Civilization. He is the editor in chief of the Oxford Encyclopedia of Islam and Law. I think the most important thing is what muslims should do within the Islamic community. We have a complete manner of treatment for situations like this. Hmm..Johnathan has insider information of coming months. I don’t know what is with the idea that the general Muslims have idealized the prominent Muslims, whether they are actual scholars is debatable, and the prominent scholars are considered to be infallible. May be because people are not buying into people’s testimony; that is considered proponent of such idea as attachment or brushing the matter under the carpet or denial. May it could be just innocent until proven to one self guilty. There seems to be too much Muslims should accept the accusations because they have been investigated. 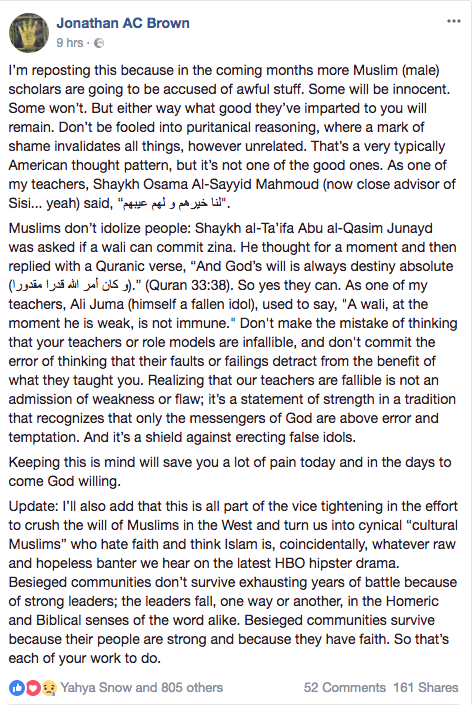 I am just skeptical of all these news; it doesn’t concern my after life and until actual undeniable evidences are presented rather than mere testimony about what happened or soothing words that “certain scholars or community” were best placed to know and found the person in the wrog or guilty. Even when the topic is disgraced Islamic leaders and their sin, this guy still has the audacity to blame part of it on non Muslims. Honestly pathetic. Honstly, you are just a troll.